Elizabeth Wills, 94, of Nederland, died Thursday, February 7, 2019, at Baptist Hospitals of Southeast Texas, Beaumont. A native and lifelong resident of Nederland, she was born January 22, 1925, to Annie Karish Parker and Ulrig Thomas Parker. For many years, Elizabeth was a local seamstress. She enjoyed gardening, cooking, baking, and shopping. Every Tuesday, she would play Dominos at First United Methodist Church, Nederland. Survivors include her daughter, Carolyn Ward; son, Tommy Wills and his wife, Arlene, all of Nederland; grandchildren, Bryan Ward and Melissa; Thomas Wills and Nicole; Jennie Tompkins and Dylan; great-grandson, Dylan Ward and Valeen; and great-great-granddaughter, Bella Ward. She is preceded in death by her parents; husband, Tom Wills, Sr.; and sister, Dorothy Graham. 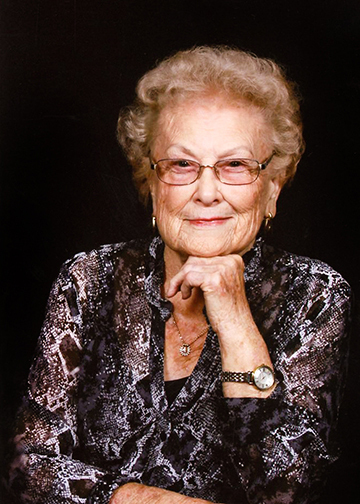 A gathering of Mrs. Wills’ family and friends will begin 11:00 a.m., with her funeral service at 1:00 p.m., Saturday, February 9, 2019, at First United Methodist Church, 1300 Nederland Avenue, Nederland. Her interment will follow at Oak Bluff Memorial Park, Port Neches. Memorial contributions may be made to First United Methodist Church, 1300 Nederland Avenue, Nederland, Texas 77627. Carolyn and Tommy, I am so sorry to hear of your mother's passing. As a young child, my grandfather, Sam Gregory, would take us to visit your mom and dad. I would often run into them while out shopping and always enjoyed catching up on our families. We are saddened to read about Me. Will's death on Saturday night. She was a good neighbor and a good person. Like so many others in Nederland, Liz did some sewing for me.. She was such a pretty lady inside and out. I know you will miss her.. We regret not attending her service, having spent Friday in Houston and not reading the paper until Saturday night. My sincere sympathy to the family of a wonderful, beautiful lady. She made me several clothes and they were beautiful. She and her husband were good friends to our family, especially with our mother and father. My father and Tom worked together at pure oil refinery and were members of the same church. We had sone good get together. May god comfort you in your sorrow. I always lived to be around Elizabeth. She always had a smile on her face and she was a wonderful seamstress. She made some beautiful clothes for me and my mother. She and Tom were friends with my parents and they spent some good times together. Our prayers will be with your family as you go through this difficult time. Our condolences to Carolyn and Tommy. We would be at the service but are out of town. My heartfelt sympathy is with you. I loved her. God Bless your family! My heartfelt sympathies to all the family. I loved her very much. God bless you all. My deepest condolences, Elizabeth was always so nice to me. Sorry I cannot attend her service, will be out of town.